I arrived in London on the Thursday morning after an uneventful journey up on the train, unfortunately this was more than can be said for the return, but more of that later. This trip was primarily to visit with Satan in two incarnations (and I certainly know which one I’d rather spend eternity with). Also Jerry JERRY JERRY, Oh and revisit the Greek Islands and go back to the future when all live music is banned. Come on Musical lovers surely you know what I mean. My base is as usual the Royal Adelphi and once I check in it’s straight out and head for the TKTS booth to see what’s on offer. A trek becoming all the more important when I notice that now that ticket prices have broken the £50.00 barrier. Not a good thing especially when everyone is still mourning the impending death of the West End in one breath, and seemingly trying their damnedest to hasten it’s demise with the other. 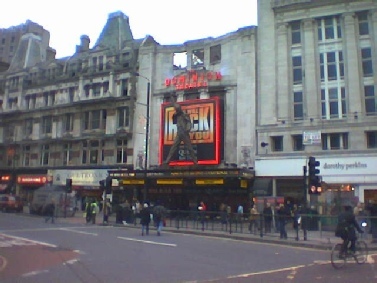 My first entertainment is the cinema at the EMPIRE Leicester Square, and to see LOVE ACTUALLY the new “chick flick”, hate that phrase especially when I’m going to see it on my own. Anyway it’s written and this time directed by the brilliantly…sickeningly talented Richard Curtis. He of BLACKADDER, 4 WEDDINGS AND A FUNERAL and NOTTING HILL fame. It tells over 10 interconnecting stories of love on the run up to Christmas and uses what seems to be every British comedic actor in the country, all other projects in this field must have stopped for the duration of the production of this movie due to lack of cast! The movie is great. Short review but to the point I think. The performances are to a “man” faultless and the writing and direction very good. This is definitely one to add to the DVD collection in due course. Cast wise we have Hugh Grant, Emma Thompson, Liam Neeson, Alan Rickman, Keira Knightly, Martine McCutcheon and Bill Nighy to name but a few. The evening of this first day is a return to WE WILL ROCK YOU, I’ve seen this before but decided on the tried and tested formula of a few shows I know I’m going to enjoy mixed with a few risks. You can get a review for this show on my last but one trip review but even thought the male lead has changed now played by MiG Ayesa, the cast are still full of energy and give their all. And I STILL think Hannah Jane Fox looks like a young Anita Dobson! Friday and I decide on Cinema then matinee then evening show, so it’s to the cinema and this time at The Warner Village for MATRIX REVOLUTIONS the final part of this enjoyable if baffling trilogy by those most reclusive of directors the Wachowski’s. I didn’t see the first or middle film in the cinema but decided to see if “This really should be seen on the big screen” was true and well… maybe. I mean it looked good but I enjoyed the others on my telly at home. I would like to say that this film provides a conclusion and for that matter an explanation to the trilogy but I don’t think it does. To me it suspiciously looks like a “pension fund” for the directors. It could be the last but could equally spawn a STAR WARS like next trilogy. But enjoyable Sci-Fi for those who like that sort of thing. The evening it was to the Greek Isle I mentioned. 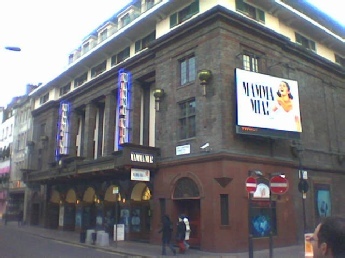 MAMA MIA the still going strong phenomenon that it seems has single handedly kept the West End’s head above water for the last few years, is about to move to the Prince Edward theatre, so I thought I’d go and see it again in it’s original home so I could compare it when they open in their new home in May 04. As this was a matinee, and for that matter a surprisingly late one at that. Not starting till 5pm. I saw mostly the alternate cast, I hate the word understudy, as to be honest by the time you get to London and are making a career in theatre you are of a standard to be classed as a performer in your own right. The principal Sophie was on and this gave the pleasant opportunity to see Alexandra Jay again. 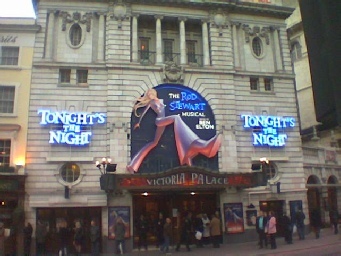 She had performed in the Festival of Musical Theatre in Cardiff 2002. She was very good and the show was as much fun as I remembered. Also I was lucky enough to have a great seat in the circle and a row which was on the main aisle so leg room a plenty and SO MANY PEOPLE COMING IN LATE! At the end of the first half Jerry is shot just after the tap dancing Nazi’s and the “Adult Baby”. In the second half you have Jerry being instructed by the Devil to host an edition of his show with himself and God as the guests. Oh and yes this is THE SHOW for which the phrase do not go if easily offended was invented. Firstly I will say the cast were excellent especially Alison Jiear as the larger lady with a dream to be a lap dancer and “Jerry” Michael Brandon who gives an uncannily spot on performance as Jerry Springer. You can probably guess what’s coming next, although with the stick I take from some quarters for never uttering this next phrase it may come as a shock to some. I didn’t like the show. no doubt realistic in that they would appear on the real show were un-appealing to the extent of alienating the this audience member. I appreciate there are people like this, and would never say the show should not be put on. I cannot even say I was offended, but I just didn’t like the show. Stand out songs, well the only one I can think of is “It’s hard being me” sung by “God” Benjamin Lake. Due to the late start of the matinee I had to see this show which itself started later as it had also had a matinee starting at 5pm, so I was unable to make the cabaret I had intended at the Jermyn Street Theatre so I returned to the hotel and we jump to Saturday. This is the show by the way with the over £50.00 tickets, and I can certainly tell you for any other show to have charged me this much I would have been seriously unhappy. I wasn’t best pleased for this one as I don’t think anyone can justify these prices. But I digress The story is the Faust Legend where a young man sells his soul to the Devil, in this version for the chance to have Rod Stewart’s in it’s place, as this will give him the confidence to speak to the girl of his dreams. The cast in this show are very good with stand out performances by the gorgeous Hannah Waddingham as the Devil, all black PVC and high Heels. Also Tim Howar as “Stu”, his voice has the raspy quality that really sells the songs of the great Scot. Finally deserving of a special mention is Michael McKell as “Stoner” a “high as a kite” British band member…. no names no pack drill as they say but never seen K**th R*****ds getting so much screen or stage time as the last few months :o) Personally I thought he sounded more like Jagger anyway. The staging was brilliant with the big “money shot” at the end bringing a round of applause as much for the staging as the final inclusion of the one song this show couldn’t have been put on and not included. 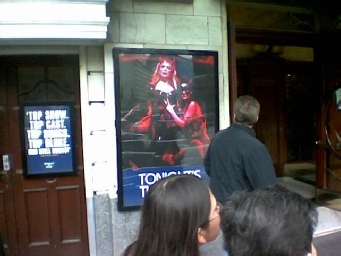 In fact this show was so good, and here the fan come into his own, I left the Theatre by one door re-entered immediately against the flow of people and booked to see the same show again that evening. I know I know but it’s a really fun show and the perfect way to round off my trip. This second viewing also gave me a different outlook on theatre in general as I realised I think that the circle slightly has the edge in most cases on the stalls, and this is something I will be experimenting with for the next few shows I see. Also in this second viewing I was introduced to a wonderful comic, no he wasn’t in the cast he was sitting in front of me in the theatre. He was there with as he described her “my third wife…looking for my fourth” and spent the whole interval entertaining three rows of the circle. 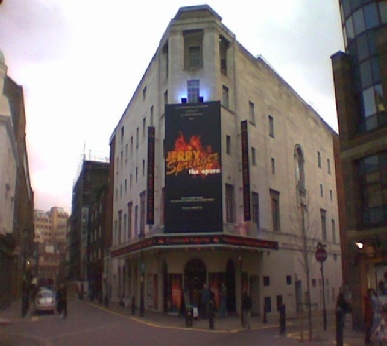 After this show I headed for the Jermyn Street Theatre for a cabaret, as I mentioned earlier I had hoped to see two but the late start of some of the shows meant I couldn’t get there in time. Really I can’t believe this I mean I’ve been banging on for years about something to do later in the evenings and they now start the shows later so even when there is somewhere to go you can’t get there in time! Anyway the cabaret I saw was Sarah Hay who currently plays Mrs Lyons in BLOOD BROTHERS. She gave a very professional performance and a varied selection, with even a guest appearance by her “son” Mark Hutchison . The evening was to raise money for Oxfam I believe, actually Sarah will be doing a sponsored walk somewhere exotic and the money was to raise the sponsorship necessary for her to go. So the end of another trip, well it was quite full, I saw most of what I wanted to, realised I don’t like EVERY piece of theatre I see. Although thinking of it I think I could honestly say there were only two shows in over 18 years I didn’t like PHANTOM and JERRY SPRINGER THE OPERA now there’s a double act for you. In both of these shows I couldn’t fault the performances. There have been others I didn’t rave over or wouldn’t want to see again. But to actually say I didn’t like the show only those two. Yes I am a fan first and a reviewer second, some might even doubt my claim to be a reviewer, as my rambling reports aren’t to everyone’s taste. But I love Theatre I want to see as much theatre as I possibly can, and with the decline in this art form both on a national scale and locally I will keep writing what I think, as in my own small way it is enticing some more people to try live entertainment and that can only be a good thing. I’d like to see again. Thankfully cabaret seems to be on the increase and with Trilby productions and the Jermyn Street Theatre at least I can get my fix of this on future trips. Unfortunately the journey home was one of the most eventful parts of the trip for all the WRONG reasons. I got the train station in plenty of time to see quite a few delayed trains and I thought “oh poor people” you can just guess what’s coming next can’t you. Yea first it was delayed then cancelled, then we were told to “get on the next one” when I asked if the tickets were still valid I was told no but to get on anyway. Well with the crowds of fuming travellers I thought no way. So on the phone and the quickest £100.00 I’ve ever spent, a car rented and I head across central London in busy traffic in a car I first set eyes on 4 minutes before…passed buck house passed harrods past this ****** who beeped me when HE CUT ME UP! And I made it to the A4 then the M4 with no wrong turns. I was amazed. So believe me there will be a few stiff letters written in the new year, and I don’t mean printed on cardboard. Just heard of one of the cast of the American Pie series coming over to do WHEN HARRY MET SALLY so I think aiming for mid Feb is the new plan.